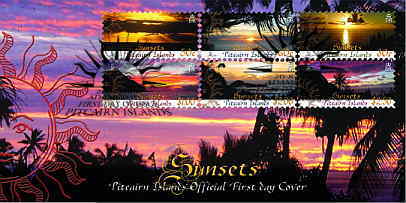 This stamp issue is of particular relevance to three Pitcairn Islanders as between them they account for having taken almost all of the stunning Sunset stamp photographs. 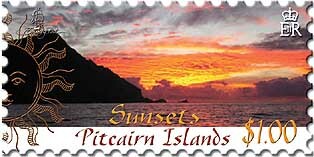 Pawl Warren, Betty Christian and Meralda Warren along with two other contributors outside of Pitcairn, Michael Brooke and the late Brian Bell, are to be congratulated in capturing the beauty and majesty of this natural wonder on another natural wonder – Pitcairn Island itself. 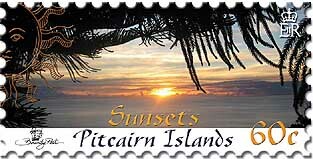 Those who visit the Island are especially in awe of the sunsets and can be seen at key lookout spots watching the sun go down while still enjoying warm temperatures. 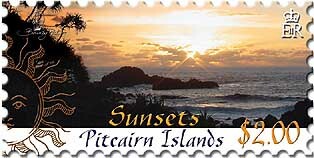 Visit any of the stunning locations at sunset and your memory will also be etched forever. 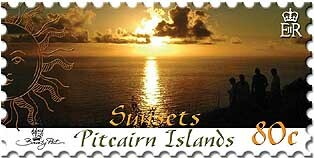 Pitcairn enjoys blue skies with vivid red and orange sunsets and these are breathtaking to behold. The displays vary however with brilliant displays of yellows, fawns, vivid pinks and purples. This phenomena of colour scatter, known as Rayleigh Scattering, was first discovered and named after the international scientist, Lord Rayleigh in 1871. All sunset connoisseurs who are aware watch for the “flash of green” which appears in a clear sky at the point of the sun disappearing. It can also appear in other colours such as blue, yellow or violet. 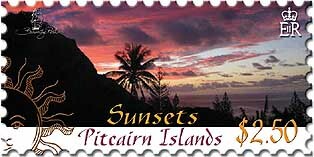 Photographers have a love affair with the Pitcairn Islands because the subject matter is so striking. From flora and fauna to vivid scenery, the country offers a host of images, which are enhanced by a palette of brilliant colours. Format: 6 single horizontal stamps. Sheet Configuration: 2 x panes of 25 stamps. 20 August 2008 for a period of 2 years.